So much for President Trump being bad for tech stocks. The Nasdaq is in the midst of its biggest string of records since the dotcom bubble. The tech-friendly index has zoomed to seven consecutive record highs through Wednesday, the longest such streak since December 1999, symbolized by the Pets.com sock puppet. 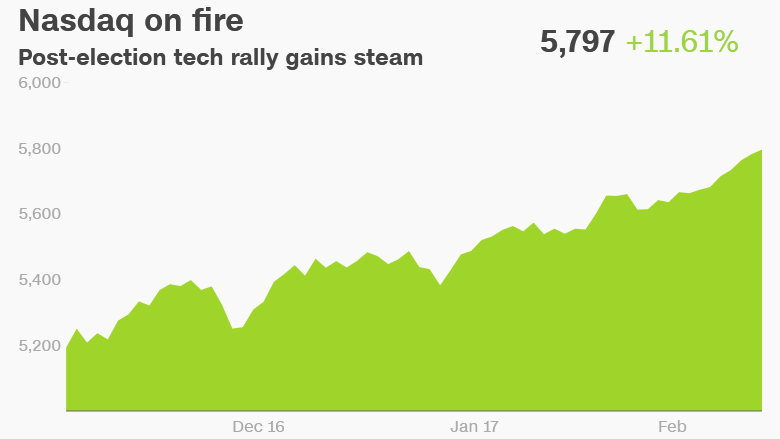 It's part of a broader surge on Wall Street with the Dow and S&P 500 also at record highs. It's the first time in 25 years that all three stock market indexes are closing at record highs for five days in a row. And CNNMoney's Fear & Greed Index is now flashing "extreme greed." But the Nasdaq boom is especially impressive considering the post-election fears that Silicon Valley would struggle under Trump. Many investors initially fretted that Trump's tough stances on immigration and trade would disrupt the tech industry's success. Instead, big gains in tech stocks like Apple (AAPL) and Facebook (FB) are helping lead Wall Street's record-setting trajectory. The Nasdaq is already up 7.6% this year, outpacing the index's entire 2016 gain of 7.5%. This year's pop has allowed the Nasdaq to catch up to the Dow's post-election surge. Both are now up about 12% since November 8. Related: Stock market rally: Credit Trump or Yellen? Even though this latest run-up Nasdaq hasn't happened since the late 1990s, that doesn't necessarily mean this is another tech bubble. Today's Nasdaq looks much healthier than the version that imploded at the beginning of last decade. Yes, some stocks like Amazon (AMZN) and Netflix (NFLX) sport enormous valuations that would make value investors like Warren Buffett blush. And some big-name IPOs like GoPro (GPRO) and Fitbit (FIT) did got out of hand. But unlike during the bubble, many big tech companies are literally making bigger profits than they know what to do with it all. 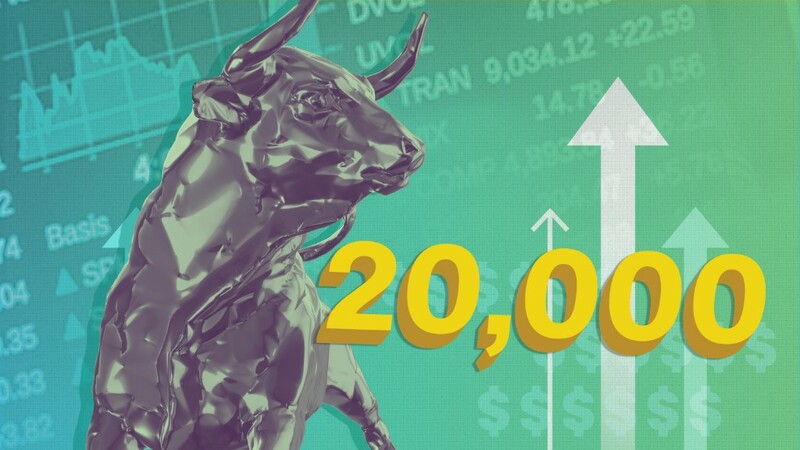 "Most of the stocks rallying today may have high valuations, but they are making money nonetheless," said JJ Kinahan, chief market strategist at TD Ameritrade. And Wall Street clearly thinks that trend will continue, no matter who's in power in Washington. In fact, tech stocks could be big winners under at least one of Trump's promises: tax reform. If Trump succeeds in overhauling tax policy -- no easy feat -- it could allow tech to bring back the vast amounts of cash they are hoarding overseas. Apple (AAPL) alone has an incredible $230 billion in cash held overseas. And Microsoft (MSFT), Oracle (ORCL), Cisco (CSCO) and Google owner Alphabet (GOOGL) --all Nasdaq stocks -- all have vast sums of money just sitting overseas. Trump's call for a one-time tax cut that would allow companies to "repatriate" that cash could be used to pay fat dividends, buy back stock, make splashy acquisitions and build new factories. Of course, tech stocks could come under renewed pressure as Trump puts more attention on immigration. One major concern has been Trump's call for visa reform, including the H-1B visa program that the tech industry relies heavily on. These visas allow tech companies to recruit talented foreign workers to come work in Silicon Valley. Tech CEOs have already been butting heads with the White House over the controversial ban on travelers from seven majority-Muslim nations. Silicon Valley CEOs have not been shy about voicing disagreement with Trump on that and dozens of tech firms have even fought the executive order in court. Expedia (EXPE) CEO Dara Khosrowshahi , an outspoken critic of Trump, even recently seemed to be poking at Trump when he ended a recent earnings call by saying, "Hopefully we will all be alive to see the end of next year." So will the Nasdaq continue its record-setting ways or is it due for a pause? Kinahan said you have to be "careful whenever a market has rallied to the level that this one has." He said investors concerned about a pullback can pocket some of their winnings, but urged against trying to "call the top" by dumping stocks entirely. Bespoke Investment Group recently warned clients that their "expectations should be tempered a bit" given the recent Nasdaq surge. "Stocks don't go up in a straight line," Bespoke wrote. And when they do, the end result (aka Pets.com) isn't pretty.